This is the weekend for the 13th edition of the New Haven Folk Festival, one of Connecticut’s largest gatherings of folk and acoustic music aficionados. This night’s musical focus was 99 percent on artists appearing at the festival, including headliner Richard Thompson. 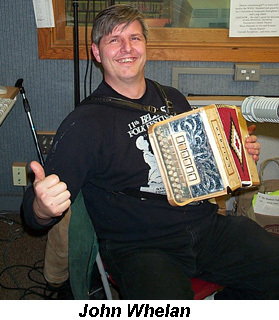 The show was highlighted by a nearly a 90-minute live session in WSHU’s Studio A with our good friend and seven-time All-Ireland Celtic button accordionist John Whelan. John closes the Saturday afternoon portion of the New Haven Folk Festival and then will be participating in sessions on Saturday night in New London at a newly opened Celtic pub and on Sunday night with fiddler Brian Conway in White Plains. The man is imbued with energy! WSHU Chief Engineer Paul Litwinovich was again our “man behind the glass” mixing sound.